If you are not aware, Costco has samples throughout their store to get you to buy more $10 boxes of stuff. 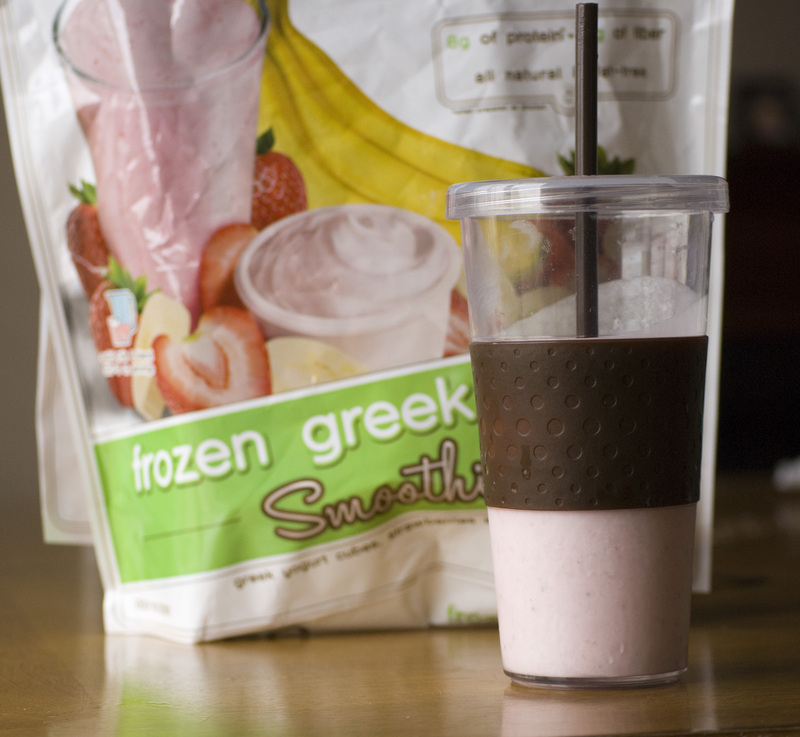 The kids and I tried a greek yogurt strawberry banana smoothie and thought it was great. I bought the bag and it is even great at home! When I opened the bag, I discovered there really is nothing to it. Being the nerd that I am, I weighed the three seperate ingredients in the bag to make at home myself. The $11 bag of strawberry smoothie gives you 5 bags that make 10 servings. $1 a piece wasn’t too bad, but I thought we could do better. It was worth it being able to figure out how they make it. The frozen yogurt they used was sweetened with stevia. The rest of the ingredients were just plain everyday greek yogurt. They did add sugar, but the total amount per serving is 9 grams, so it can’t be much. 1. Take an ice cube tray and fill it with the greek yogurt. Make them small – so fill it up only about 1/4 of the way. See how thin the company makes the yogurt pieces? They are pretty small so they blend well. Plus it freezes faster this way. 2. 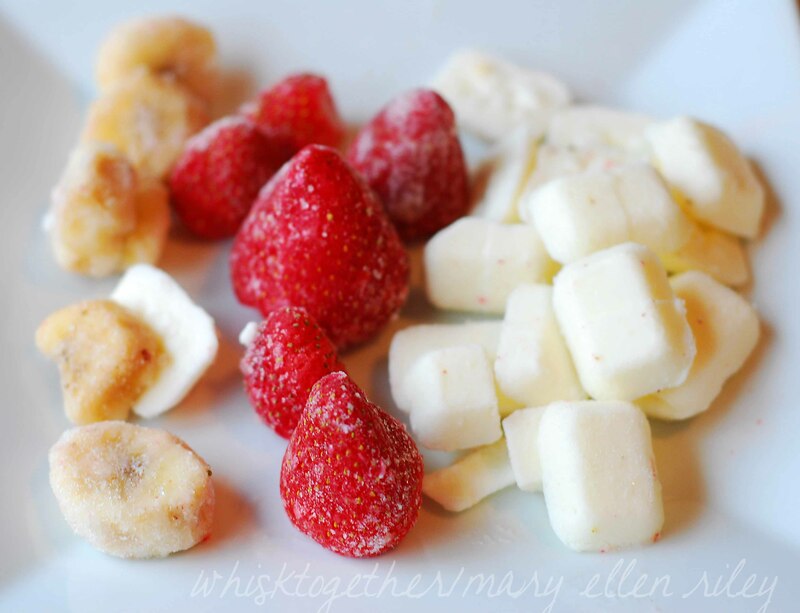 Remove yogurt from ice cube tray and mix with bananas, strawberries and sugar (optional). Put in individual baggies. Put all the baggies in one large ziplock bag and label. 3. To make smoothie: Add the baggie ingredients to 1 cup of skim milk in a blender. Blend on high 45 seconds. My blender usually needs a stir in order to “burp” after 15 seconds. Then it works great. Pour and drink! Yay! 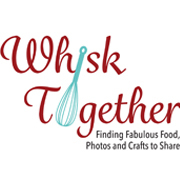 I was thinking the same thing when I tried a sample of it at Costco…”wonder how I can do this at home?” Thanks for “dissecting” the ingredients for us! 🙂 Can’t wait to try at home! What would 3.5 ozs of greek yogurt in the cubes be? I really couldn’t estimate – if you are asking about how many cubes it really depends on the size of the ice cube tray. I weigh my ingredients for baking and so I used the same scale to measure the yogurt.